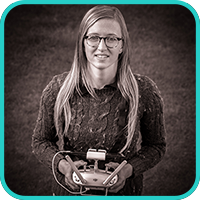 Gemma Alcock is an award winning innovator and unmanned aerial vehicle (UAV) designer and the founder and managing director of an aerial technology company, SkyBound Innovations. Gemma has been an aerial enthusiast for many years, from flying UAVs to skydiving. She has also worked within the search and rescue (SAR) industry for the past 3 years, in both professional maritime rescue roles for the Royal National Lifeboat Institution (RNLI) and volunteer flood response roles. It was her passion for both the UAV and SAR industries that spurred on and inspired The SkyBound Rescuer Project. UAV. She has also had contact with Dorset Police, Chief Fire Officers Association (CFOA), International Association of Fire Chiefs (IAFC), Fire Department City of New York, to name a few, for varied research opportunities. This blog has been created to share the growing amounts of research findings to the SAR community. In 2015, Miss Alcock won the Royal Academy of Engineering’s Most Commercially Innovative Award with a concept SAR UAV design that was a direct result of her SAR UAV research that will be posted throughout this blog. Furthermore, Gemma recently received the Highly Commended award in InnovateUK’s Women in Innovation competition with The SkyBound Rescuer Project. She is truly committed to and passionate about creating a future where UAVs will routinely be saving lives.